US, 2017, 94 minutes, Colour. Arnold Schwarzenegger, Scoot Mc Nairy, Maggie Grace, Judah Lawson, Martin Donovan, Kevin Zeegers. 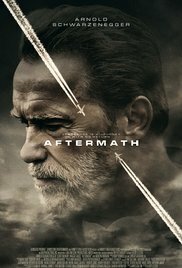 Aftermath announces that is based on a true story. The aftermath of the title indicates the period after an accidental plane crash and its effect on a husband who lost his wife and daughter, on the air traffic controller and his sense of responsibility and guilt, the consequences for his wife and son. Audiences who know Arnold Schwarzenegger from his action films would be very surprised at his serious performance here, restrained and brooding in grief, finally bursting out in anger. It is a very serious role, none of his previous actions styles or dark humour. Scoot Mc Nairy is good as the air traffic controller, difficulties in the control room, technical difficulties, his not paying full attention with disastrous consequences. He is married with a son. The film shows the immediate aftermath, the father brooding with his grief, wanting an apology from the airline company but their simply offering a financial contract. The air traffic controller has difficulties with his wife and son, does not want psychological counselling but a prescription, takes drugs but cannot take his life. The film moves to a year later, the father continuing manual jobs, the air traffic controller with another name working as a travel consultant. The father gets a journalist to give him the controller’s address and there is a final confrontation, and a jolting surprise as the father slits the controller’s throat – in the presence of his wife and son. And then 10 years pass, the father serving his time in jail, being released, going to the cemetery and to the graves, the controller son following him, threatening him with the gun – but unable to follow through. The rest and the aftermath is left to the emotions and imagination of the audience. 1. Based on a true story? The plausibility of the air controller’s error? The response of the families to those who have died in the crash? The interlinking of the lives? 2. The titles on the introduction to both Roman and Jacob? 3. Roman, his work on the building site, skills, thoroughness, reputation, hard work? Looking forward to the arrival of his wife and daughter, her pregnancy? The boss, persuading him to take time off? The flowers, going to the airport, asking questions, in the waiting room, the news, his being stunned, the offer of help? Alone at home? His continued brooding and its taking possession of him? 4. Jacob, his wife, his son, ordinary life? Going to work, air traffic control? The basics of the work, getting a cup of coffee, the technicians coming in, the phones not working, his going to the other phone, taking his headphones on and off? Not hearing the request? Looking at the line of the two planes, the disappearance, the crash? The consequences? 5. The title of the film and its application to Roman and to Jacob and his family? 6. Roman’s story, unable to let go, the discussions with his boss, home movies, the photos? The encounter with the authorities from the airline, the lawyers and their harshness, the nature of the contract, the emphasis on money? Roman saying that no one had said sorry? Forcing the lawyer to look at his photo? Walking out? 7. Jacob, overcome, wondering about how many had died? The discussions with the authorities, their sympathy and support? At home, the tension, his son, his wife, watching the television news, the dispute about making breakfast? The authorities, the discussion about the severance pay, moving, changing his name, another job? The reaction of his wife? 8. The year later, Roman and his work on the fence and being praised, but still brooding? The journalists and the interrogations? Asking the journalist to find Jacob’s address, her bringing it to him, in the diner? His visit to the apartment, Jacob’s reaction, wanting to call the police, Roman’s slitting his throat? Is Lying on the floor dying, the blood? His wife coming in, his son? Roman showing Jacob the photo and wanting an apology? 9. The year later, Jacob, the new name, working as a travel consultant, going to his apartment, the initial despair, the psychologist, wanting the prescription, the pills, bringing them up? His wife’s arrival, his son? Roman at the door, the photo, wanting to call the police, his death? 10. Roman, going to jail, the discussions with the authorities, his having to go to psychological sessions? 11. The release, going to the cemetery, his previous visit to the cemetery, even spending the night with the caretaker asking him to leave? His being followed by Jacob’s son? The confrontation, the gun at his head, Roman ready to die? The boy unable to shoot Roman? His sitting with his grief? Roman leaving? 12. The future for each of them?